In the lead-up to Philip Pullman’s highly anticipated prequel trilogy to His Dark Materials, The Book of Dust (book one, La Belle Sauvage hits shelves in October) let’s take a moment to appreciate the glory of the originals, Northern Lights, The Subtle Knife and The Amber Spyglass. A contemporary classic in every sense, Pullman shocked and delighted readers young and old with the adventures of Lyra Belacqua and her shape-shifting daemon, Pan, in their quest to rescue their missing friends and take down the almighty Magisterium. With his spellbinding prose, rich worlds, and incredible cast of characters (including the ruthless Mrs Coulter, the powerful Lord Asriel, and -– of course -– Iorek Byrnison, the talking armoured polar bear), Pullman blends religion, science, philosophy and hefty dose of good old-fashioned adventure to create one helluva stunning read. My personal favourite: book two, The Subtle Knife. Read them all ASAP. Aussie author Gabrielle Tozer’s latest YA novel is a fantastic read for teens and adults alike. Layla hasn’t set foot in the country town of Durnan since her mum died in a tragic accident and her father packed their bags. That was five years ago. Now she has returned. Milo’s the kid who never left. He’s treading water, working at his dad’s bookshop and pining for his long-term girlfriend, missing his friends, who have all left Durnan for bigger and better things. Layla and Milo used to be neighbours, best buddies, but time has changed them both. Will they rekindle their friendship? Will it lead to something more? Or are there just too many reasons to turn away? I loved this “boy-meets-girl-again story.” The rural setting, the laughs, the sucker-punches to the heart. I was rooting for Milo and Layla every step of the way, and yeah, I nearly cried (but I held those tears back because I am tough and manly, dammit). For me, it’s Tozer’s portrayal and exploration of grief that’s the real standout here. An entertaining, heartfelt read you’ll chew through it in no time. Basic info: Set in Hackney. Very dark teenage read. Marlon, a black boy is on his first date with Sonya, a white girl. They both take some ecstasy. Sonya convinces Marlon to hold on to her stash. They are at a local carnival. On one of the rides, Sonya dies. Marlon is questioned by the police. Marlon is a somewhat naive and frustrating character - he makes bad decisions (I kept shouting ‘nooooo'! in the background): while trying to do the right thing, he ends up sometimes doing the wrong thing. It’s very compelling, fast paced and very ‘now’. There are loads of zombie stories out there. From Night of the Living Dead to The Walking Dead and World War Z, these happy-go-lucky tales of dismembered limbs and flesh-eating monsters have enthralled and disgusted us for decades. They can be grim. They can be fun. They can even be a little bit same-same. Brains, blood and guts. Hoards of the undead. A rag-tag bunch of survivors with (more often than not) questionable decision-making skills. First published in 2014, M.R. 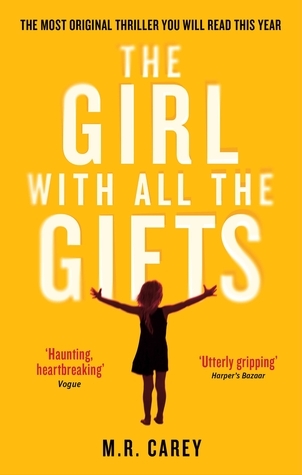 Carey’s The Girl With All the Gifts offers something new. Sure, the usual ingredients are here. The apocalypse has come and gone, survivors are few and far between, the military’s doing its thing. This zombie-plague, however, was triggered by a fungus that now covers much of the British countryside, and the spores can be just as deadly as a bite from a zombified postman. Happy days. The coolest part? A new breed of zombie (or ‘hungry’ as they’re called here) is evolving. Melanie is an infected 10-year-old with a genius-level IQ and beautiful soul to match. She lives in a military outpost designed to study children like her. They live in cells. They’re wheeled around in Hannibal-Lecter-type restraints. They even go to school, taught by the lovely Helen Justineau, Melanie’s favourite. Justineau disagrees with the team of scientists who experiment on the children, butting heads with Dr Caldwell, who will stop at nothing to find a cure. A girl as light as air. An invisible boy. A necromancer. A boy with a hive of bees living in his goddamn stomach. These are just some of the crazy kids found in Miss Peregrine’s Home for Peculiar Children, the debut novel from American author Ransom Riggs. An immediate New York Times best-seller upon publication in 2011, this is the latest YA fantasy-thriller to get the big-screen treatment, coming to cinemas in September courtesy of Tim Burton himself, the guy who brought us Beetlejuice, the good Batman movies, Edward Scissor Hands, and about 50 billion other movies starring Johnny Depp in crazy wigs. There’s time-travel. There are monsters. There are kids with messed-up abilities. Perhaps the coolest element though? Riggs weaves a fantastic collection of (kinda disturbing) old photographs throughout the story, some of which inspired the characters themselves, to create an unforgettable read. And don’t worry, Johnny Depp isn’t starring in the film adaptation, but Eva Green is, so two thumbs up from this guy already. Oh, and it’s the first in a trilogy. Of course. Happy reading! f you would like to know more about the way Orthodox Jews lived before the Holocaust then read this delightful historical novel by Anna Ciddor. Based on the stories told to her by her grandmother, the novel is set in Lublin, Poland in the 1920s where the large and loving Rabinovitch family live a traditional and rich cultural life determined by the teachings of the Torah. Extensive research informs the backbone of the novel which describes daily rituals including meal preparation, the beauty of the Sabbath and special celebrations such as the betrothal and wedding of the oldest daughter Adina to a man she has never met as was the tradition. But this is also a real live family full of mischievous younger children, serious older ones and the in-betweeners who are learning their place in the Jewish world. Father is a warm-hearted devout Rabbi and Mother is a bustling busy wife and mother overseeing a boisterous household. nna has enhanced the story with her charming tiny black ink illustrations at the beginning of each chapter and a portrait of the whole family at the beginning. Although the novel is nominally for children 8-12 it is really for anyone aged “8 to 108”. A powerful novel that absorbs the reader completely into the emotions experienced as a result of family tragedy, loss, first loves and true friendships. Jude and Noah are incredibly close twins, only a few hours apart. When they were thirteen, Noah was quiet- always drawing and recklessly falling in love with the boy next door. But that was fine because Jude would always talk for him, while she jumped off cliffs and hooked up with boys behind park sheds. Then something changed. At sixteen, Jude is drowning in her mother’s hatred and can’t remember the last time she talked to Noah without fighting...that’s until she meets a charismatic boy and a nutty artist. If Noah and Jude could tell the truth, the whole dark truth, maybe they’d realise even while they screwed up they always had each other. This novel requires the readers to throw themselves in headfirst; it is not a normal teen romance its abstract and crazy, these are two children who trade the sun after all, but in that way it is utterly engaging. In fact, the true achievement of this novel is that it uses the crazy imagination of the two protagonists and the wild stories they create to poignantly reflect everyday truths. Suspense. Intrigue. Danger. Secrets. The fabulously wealthy. And lies upon lies upon lies. What could go wrong? The Sinclair’s are the perfect family, no criminals, no addicts, no failures. Who cares if it’s a façade, a lie, everyone can see they are perfect? So are all the people who rest on the private island off the coast of Massachusetts. So are the Liars- a group of four friends. Until their relationships unravel. Soon everyone is scrambling to bury their secrets and then they begin to drown in their own lies. The brilliant, damaged girl and the passionate, political boy, all liars. This modern suspense is gripping and a dangerous read. E. Lockhart has a unique writing style that is poignantly simple and utterly effective in creating anticipation. The plot line spirals and grows like the lies and the characters are dangerously and worryingly realistic. They could be anyone of us. Read it. And if anyone asks how it ends, just LIE. Far more than a love story this is a classic coming of age novel, which is honest and enthralling and filled with ‘just-one-more’ chapters. Delilah is familiar with the consequences of misplaced crushes. After falling for the classic popular girl she has become the punch line in an array of homophobic jokes. Not only that but she is barley able to keep her family café afloat now that the manager took off and her dad went international. And now she has fallen again, this time for a stunning flamenco dancer across the road- Rosa. Her best friend Charlie understands, he is always off doing outrageous acts to win the hearts of women. But now Charlie’s in jail, she might have to break the law and Rosa is full of mixed signals. How can you tell another girl you love her without it ending in heartbreak and humiliation? And even more, when everything is falling into chaos is it possible to keep the beat? The true triumph of this novel is that it addresses the love felt by LGBT teens with equal importance, messiness and passion as any other. It is captivating, uplifting, real and funny and filled with authentic voices and interesting dynamics. It is not a book people should just want to read. It's a book people need to. Wonderfully written, absorbing, thrilling, tragic and touching. What more can you want? Tess is married to Jay, a charismatic, generous and attractive man who says he loves her. Four years later his love has turned to violent physical abuse. To save her child’s life Tess makes a desperate escape. Through the assistance of a stranger Tess embarks on a road trip back to her family. But in four years more a lot has changed. And the question remains- will Jay find her? The terror created by Jay stimulates the book and allows you to gain insight and empathy for those affected by abuse. In this way it explores family violence and mental illness without lessening or simplifying the issues. Not all doom and gloom the story also describes the incredible difference that a stranger’s kindness can have on a family. Leaving you with the sense that there is underlying hope in even the most horrific of situations. This book is bright, uplifting, genuine and real. Will Kostakis has a unique and engaging writing style that fills the story with vivid, lovable characters and relationships. This light read is inspiration, moving and completely enjoyable. Bill’s grandmother gave him one final message. Life if made up of three parts: in the first third, you're embarrassed by your family; in the second, you make a family of your own; and in the end, you just embarrass the family you've made. Oh and a bucket list and the responsibility to fix his broken family. But with the help of his hilarious, insecure best friend Lucas and amazing but mysteriously absent girlfriend he may just complete it. He has to, because the first third has to end some time. And then what? I recommend this read to anyone who wants to laugh and smile and think poignantly for a bit before laughing again. For a great story about the endearing nature of friendship and resilience of family look to the First Third. The Paradise Trap is an exciting book full of twists and turns; you never know what’s going to happen next. It’s a light read and doesn’t have much depth. If your looking for a fun, stimulating ride this is the book for you! This book teaches the reader that a true paradise world is one where not everything is perfect and makes you question whether you are strong enough to escape a fake paradise. So will you escape or fall for the paradise trap?